Thousands of Girl Scout Cookies were donated during this year’s cookie season and are now on their way to soldiers overseas. Girl Scout troops like 2030 have worked hard to encourage people from the community to purchase cookies as a donation to the troops overseas because two of the girls in the GS troop have brothers in the war. Many of the cookie boxes donated had hand written messages on them, and the council had a place on the web site to write a message to be placed on the cookie boxes. During the cookie season GS troops from the council area sold boxes of cookies to people who donated them to the soldiers. 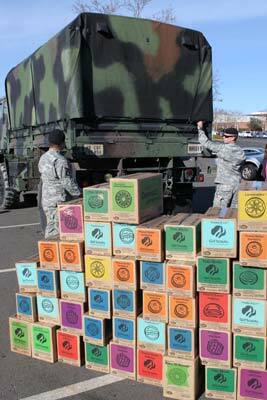 These boxes were recently picked up by the National Guard who ensured they were shipped out. Thank you to everyone who donated cookies to the soldiers during this cookie season and all the troops and troop leaders that worked so hard. Next Post Going Green? So are They!